Sign up for Broadjam today to follow Gary Scott Huddleston, and be notified when they upload new stuff or update their news! This CD was made to honor God and all His goodness. It is also my testimony and life. I also decided to do everything myself. Written, Arranged, and Produced by Gary Scott. My 2nd album recorded in1994 Full CD 12 songs. 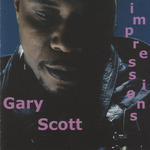 All originals, written, arranged and produced by Gary Scott. Written for a woman at her wedding, as she read a letter to her mother who had passed away.